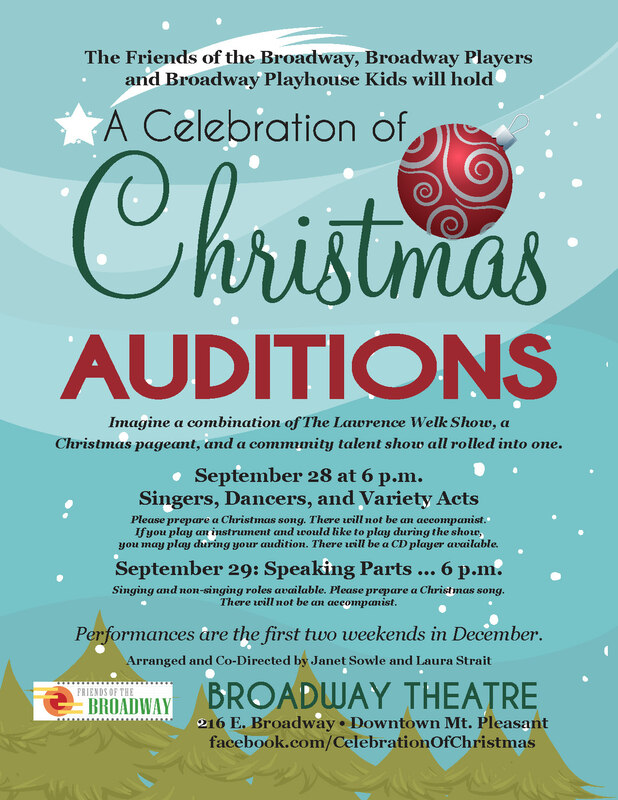 The Friends of the Broadway, Broadway Players and Broadway Playhouse Kids announce auditions for “A Celebration of Christmas” will be held Sept 28-29. The production will include variety show acts and Christmas pageant all wrapped into one story. Ages 5-105 are encouraged to audition. Auditions for singers and variety show acts will start at 6 p.m. on Sept. 28. Singers should have one verse and chorus of Christmas song prepared to sing. There will be no accompanist. There are several opportunities for solos, small group numbers and both children and adult choirs. Variety show acts including dancers, musicians, and more should be prepared for limited setup time. There will be a CD player available. Auditions for those who wish to have a speaking part will be held on Sept. 29 beginning at 6 p.m. There will be singing and non-singing roles available. Those who wish to audition for a singing role should have one verse and chorus of Christmas song prepared to sing. There will be no accompanist. Performances will be held the first two weekends of December. The production is being arranged and co-directed by Janet Sowle and Laura Strait. Auditions will be held at the Broadway Theatre located at 216 E. Broadway in Downtown Mt. Pleasant. For more information, leave a message at (989) 772-2075.